Start with a little liquid at first and then add more as needed. The dough is supposed to stick together when you squeeze it, but if it doesn’t hold the shape, add some more of the liquid. Even after adding all of the liquid to the dough, it still wouldn’t hold together. I found that pressing the dough into a ball several times (it broke apart from the gentle squeezing quite often), the dough began to hold together more each time. Eventually, I was able to cut the ball into eight pieces without having the whole thing collapse under the knife. Pressing the dough pieces into flat discs helps to smoosh the butter pebbles into butter flakes which in turn creates nice flaky pastry. After stacking the discs together and forming the dough into a ball for the second time, I felt that the dough was more cohesive and workable. I divided the dough in half and chilled the pieces for a couple of hours before rolling it out for the bottom and top crusts. My top crust was actually a mesh of little cutout flower and leaf shapes because I told myself that was easier than a lattice top. In hindsight, I think it was more work. But it’s still very pretty. 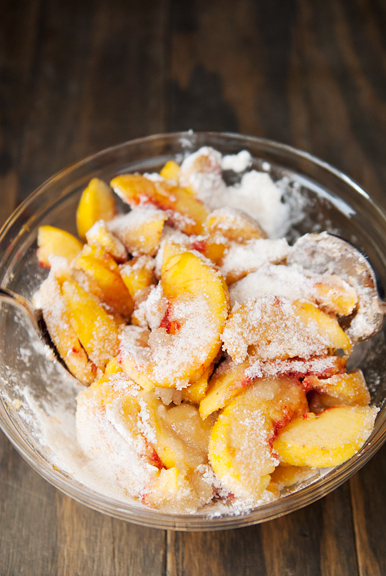 While the dough was chilling in the refrigerator, I prepped the peach filling. 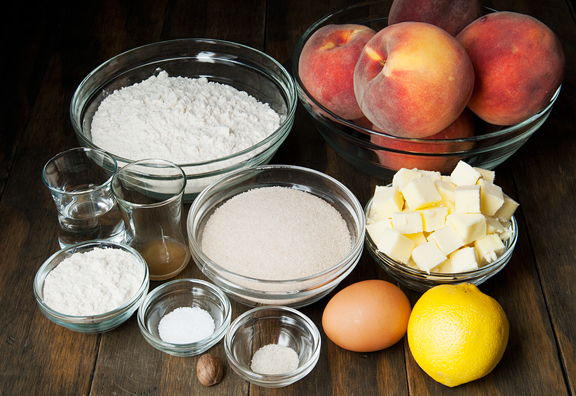 Peach pie is very forgiving if your peaches aren’t perfectly juicy and ripe. 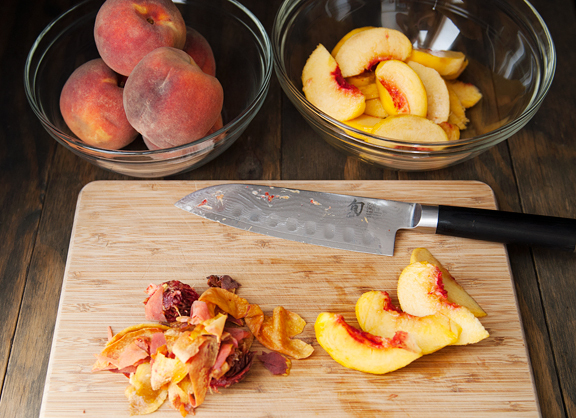 I had a couple of peaches that had a mealy texture, but once baked, I couldn’t distinguish them from the other peaches. Since my top crust was a loose collage of cutout shapes, I crimped the edges of the bottom crust. 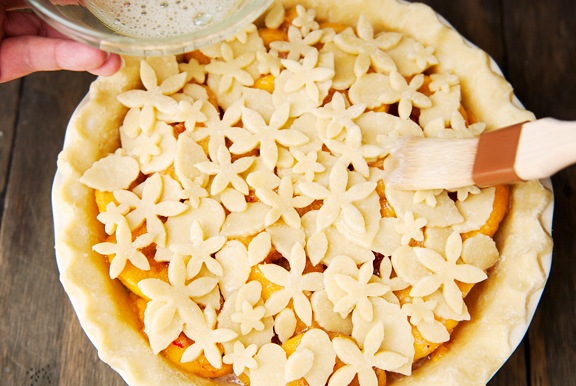 If you plan to lay a top crust or a lattice over the peaches, then don’t crimp the edges until you seal the two crusts (unless you like crimping twice). 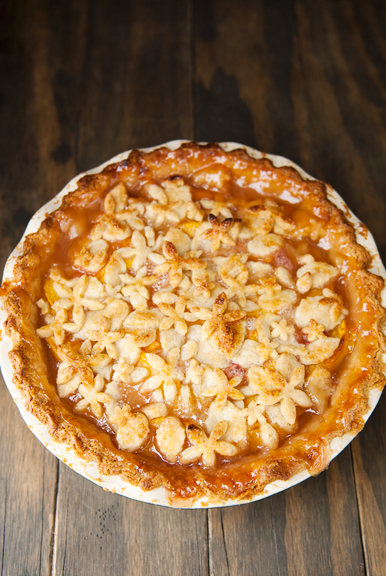 When the peaches were in the pie, I grated fresh nutmeg over the top and then set to work distributing the cutout dough and preparing the pie for baking. The pie baked up nicely, but in the last ten minutes the peach juices and sugars began to boil over the edges. Luckily, I had a sheet of foil on the rack underneath the pie, but some of the sugary goo still managed to hit the oven floor and burn and smoke. I think some of that lost volume resulted in a slightly deflated pie. And while my preference is for well-browned pastries, I had to remove the pie from the oven a little earlier than I would have liked for fear of losing more of the filling to the oven floor. Taking that first bite of pie confirmed that wrangling the pie dough was worth the trouble. 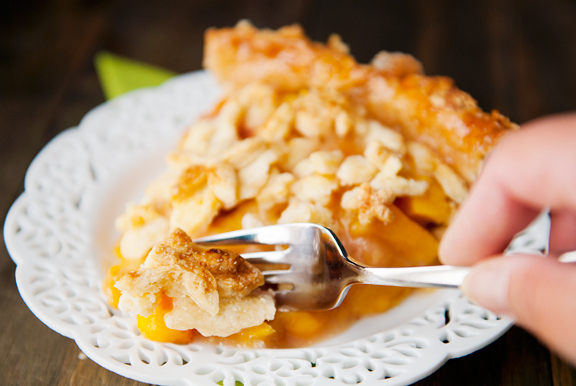 The pie crust was flaky and buttery and tender, which is the perfect accompaniment to the velvety sweet peaches and peach juices. It is my intention to explore other pie crust recipes and methods, but this one is certainly a keeper. Maybe, just maybe, my friend will start to see more pies coming out of this kitchen. 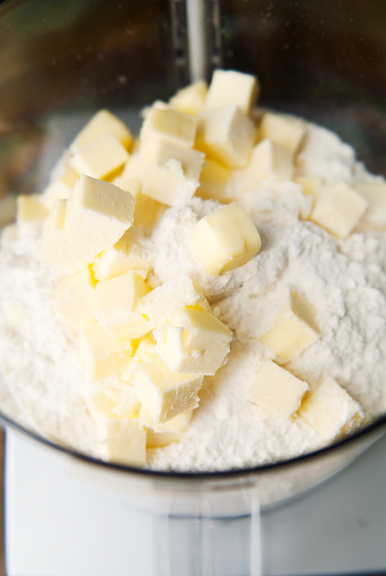 Make the pie crust: Blend the flour, butter, and salt together in a food processor until the mixture becomes small pebbles of butter (1/4-inch diameter). 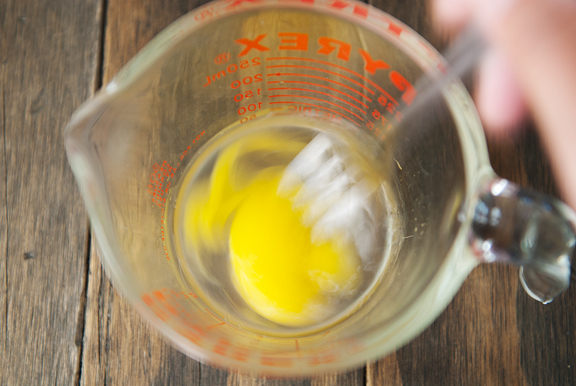 Combine the egg yolk, vinegar, and ice water in a measuring cup and drizzle about 4 tablespoons of it over the flour mixture. Pulse the dough or stir it to incorporate the liquid. Grab a bit of the dough and squeeze it between two fingers. If it sticks together, you’re good. If it crumbles apart (too dry), add a little more liquid and repeat. I used all of my liquid. 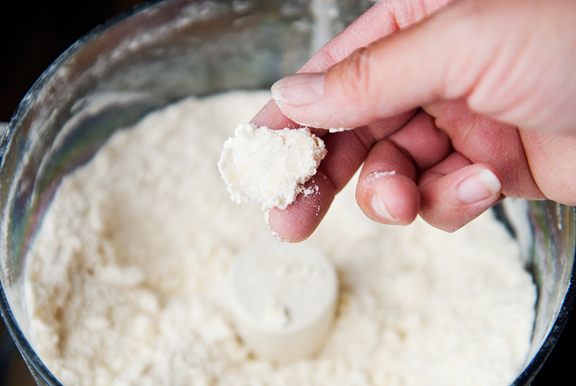 Turn the dough out onto a lightly floured surface and press it into a ball. 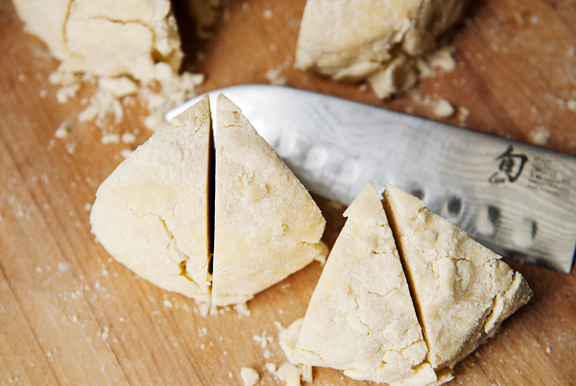 Divide the dough into eight equal pieces, flattening each piece with the palm of your hand (to flatten the butter). Stack the pieces and form the whole thing into a ball of dough. 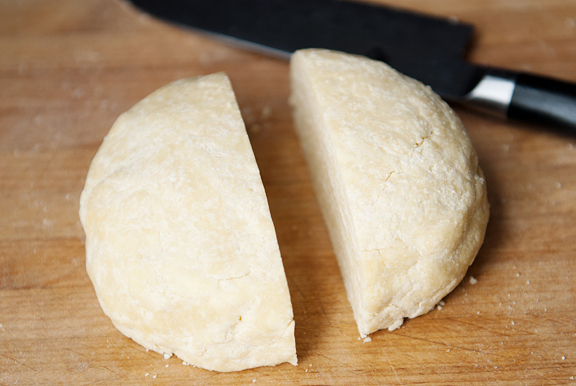 Divide the ball in half and flatten each half to 5-6 inch dough discs. 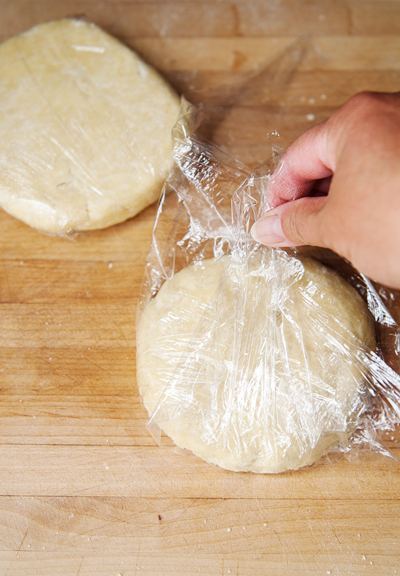 Wrap in plastic wrap and refrigerate for at least an hour. 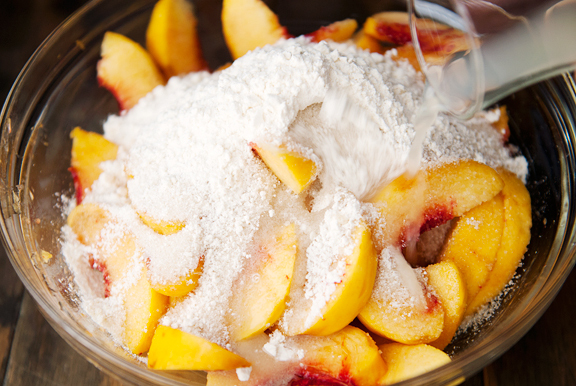 Prepare the filling: Gently toss the peaches, lemon juice, sugar, and flour in a large bowl. Assemble the pie: Preheat oven to 425°F. [Note: You may want to place a pan or sheet of foil on the rack below the pie to catch any sugary drips.] 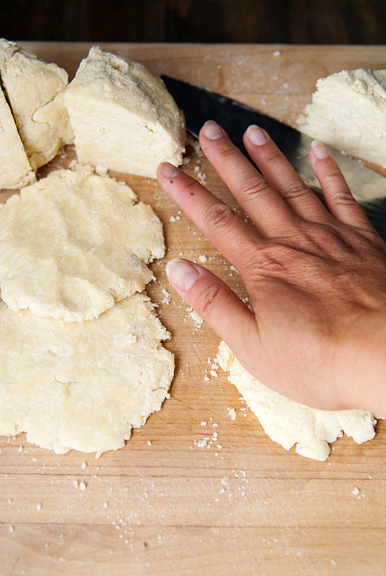 Roll a disc of dough out on a lightly floured surface to about 1/8-inch thickness. Set the pie dough in a 9-inch pie dish. Pour the peach filling into the pie dish. 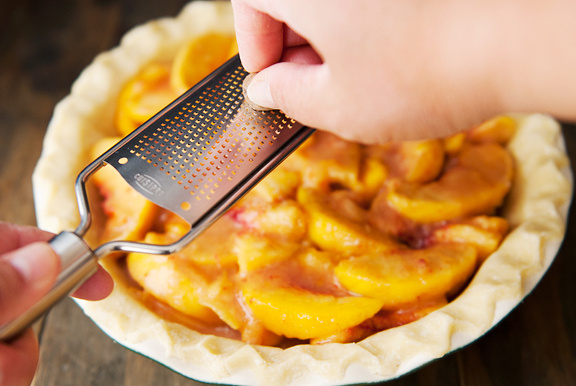 Grate or sprinkle the ground nutmeg over the top of the peaches. Roll out the second disc of dough. 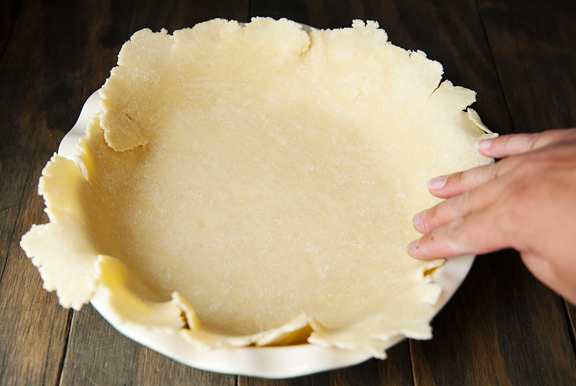 Wet the edges of the bottom pie crust and lay the second crust on top. 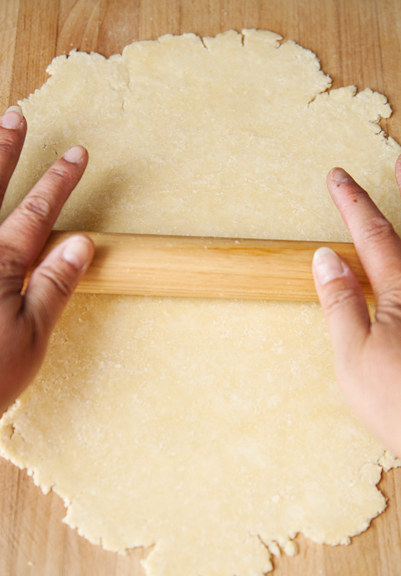 Seal the edges of the pie crusts together and then trim as needed and crimp the perimeter of the pie. 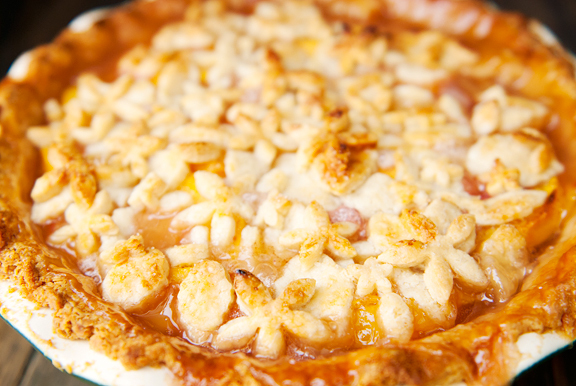 Cut steam vents into the top pie crust. 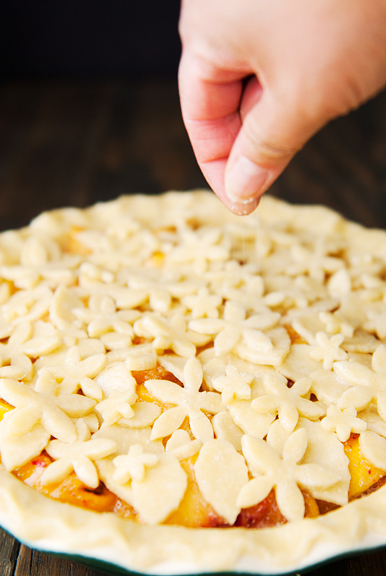 Brush the top crust with egg white and then sprinkle sugar over the top. Bake 15 minutes then reduce the oven to 375°F and bake another 45 minutes to an hour until the pastry is golden and the filling is bubbling. Serves 6-8. I have tried a whole bunch of different pie crusts and never found one I loved until this one. The dough is so easy to handle, and it bakes up into tender and flakey layers everytime. It’s amazing! The recipe is also pretty much bomb-proof. I’ve made it with a food processor, as specified, which works great. I’ve also made it with a stand mixer once, which also worked great. I’ve made it in a kitchen so warm that the butter was practically melting in my eyes, and yet it still baked up fine. Lately, I’ve been making that recipe by hand because I am sans food processor and stand mixer at the moment. I use the same ingredients but a different method. First, I rub in the butter into all the flour by hand until there aren’t any butter chunks left (against all rules). There’s almost always some dry flour left, which is fine. I figure that gives the same result as the original recipe where you mix the butter in with 2/3 of the flour and then pulse in the remaining 1/3 of the flour. Then I pour in the cold water, mix everything together a bit with a spatula until there’s no loose liquid left. I dump the whole mixture (buttery flour, dry flour, wet doughy bits) onto a flat surface and hand press it into a rectangle, then give it a few rough folds a la puff pastry. The first couple of folds are a mess because there’s dry floury bits and wet sticky bits everywhere. But just tuck all the loose bits in between the folds and everything settles down after a couple of folds. I usually don’t bother flouring my surface. Usually some parchment paper and a pastry scraper gets the job done. Once 95% of the dry bits are incorporated (about 3-4 folds, I don’t usually keep count), I cut the dough in half, wrap in plastic wrap and stick in the fridge to chill. Either method, the recipe is great. And produces a dough that’s easy to handle and doesn’t tear easily. I feel your pain, pie crust-wise. I have hated making pie crusts for years — but I adore pie. Then, I discovered the pie crust erroneously attributed to Christopher Kimball. It was one of his ATK researchers who came up with Foolproof Pie Dough. The researcher, J. Kenji Lopez-Alt, changed my life because it IS perfect — especially for for those of us who hate making and rolling dough because it always, ALWAYS falls apart. 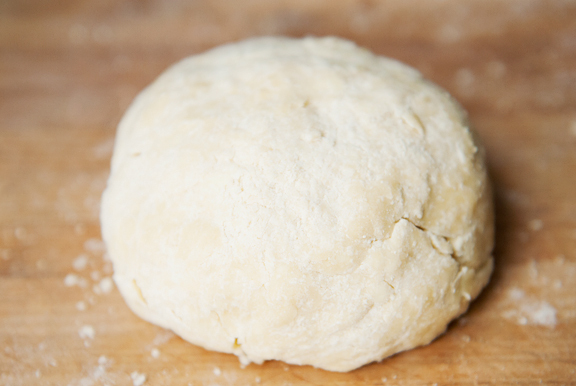 Rather, this dough recipe uses physics to make it phun (pardon my physics humor) by using tons of butter and lots of vodka to keep the dough together. Makes it moist enough to roll out easily, place, fill and then bake. The baking evaporates the alcohol in the vodka, leaving a deliciously buttery, flakey, golden crust. I highly recommend it! It’s changed my ‘tude about pie baking in general and rolling pie crusts in particular. Now I’m a pie baking wiz, a change that delights my previously pie-deprived family. 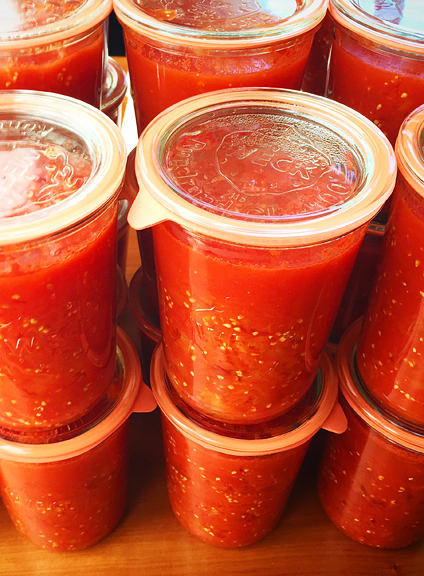 And, I have canned tomatoes for years. I purchase them from a farm nearby. Our deluge of nightshade comes in August. I can because it reminds me of my mother and grandmother. Standing in front of a sink of steaming tomatoes, talking, and laughing while we filled jar after jar of tomatoes. They taste great and you know what’s in them. I don’t have to do it these days, but I love to do it. And now my MD daughter comes home to help me and we stand at the sink, filling jars, spending precious time together. It’s a tradition she hopes to pass along to her family one day. 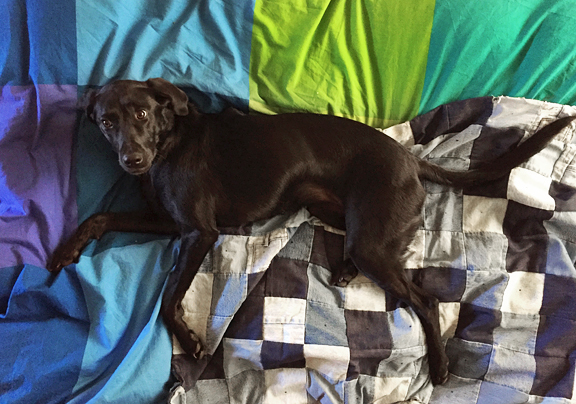 Neva knows she looks pretty against those colors on the bed! 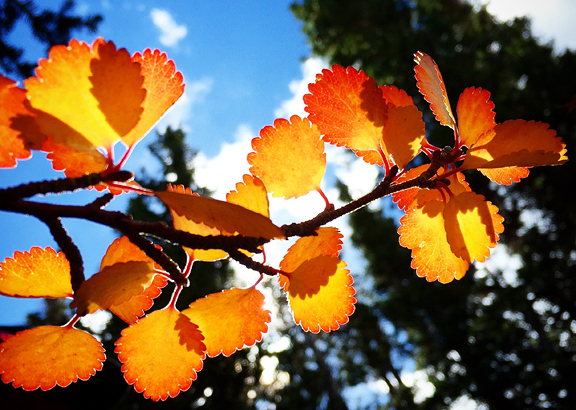 And those aspen pics!!! Hope you have enough tomatoes to get through the winter. I wonder why those jars are your favorite? Enjoying every photo and recipe, thanks! I managed to score a copy of “The Pie and Pastry Bible” by Rose Levy Breabaum at a library book sale. It has profoundly impacted my approaches to fruit pies. One of the game changing techniques is to sugar the fruit and let it stand for a bit. Then she drains the liquid off and reduces it significantly on the stove before adding it back into the filling. Combined with some crust techniques outlined in the book it’s actually possible to get a firm fruit pie with a crispy bottom crust- something that has always eluded me. If you can find or borrow a copy of the book I think you would really enjoy it! 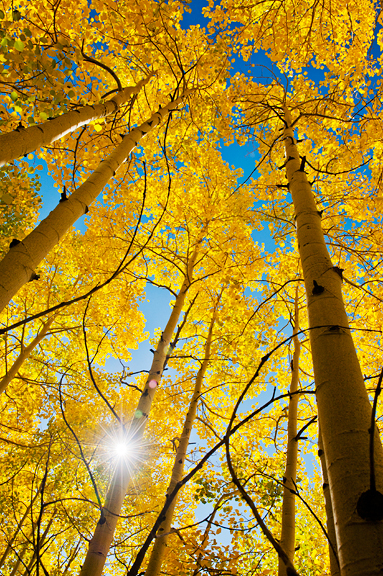 The aspen photos make me pine for the mountains! So gorgeous. May I also suggest a recent pie crust post on the Hong Kong-based site Lady and Pups: An Angry Food Blog? The author’s imaginative yet meticulous and scholarly disposition, much like yours, come to think of it, turns each and every recipe’s procedural step almost onto its head. Highly recommended. So happy to hear you will be adding more pie baking! I’ve had serious trouble with crusts since we moved to 6100′. My Santa Fe cousin has a high altitude pie baking book and it says a fallen filling is a common problem of elevation. His recipe is like yours and he too thinks that we need more water than lower elevations, but it can quickly go wrong. The second Saturday in September, Pie Town NM has a pie day contest. No pre-made crusts win this event! I’m going again next year. If you go, I’m sure you will win! (And I’ll be able to meet you!). 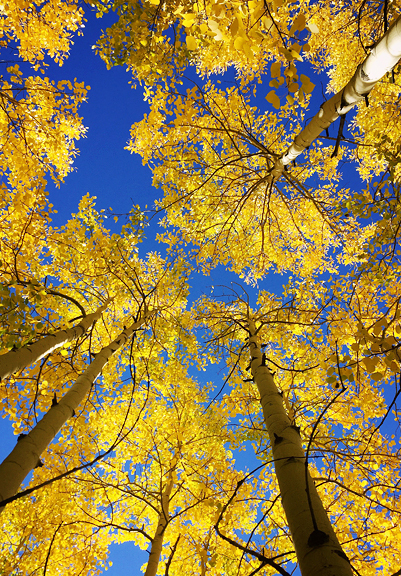 Yea fall!! My favorite dessert is pie but have to admit, in my old age I’ve become a lazy baker. My 2 favorite pie dishes are Pyrex, 9.5 inches and deep dish. Since they are larger than your traditional 9-inch pan, I had to search for a crust recipe which would have an adequate dough edge for crimping. I discovered Ina Garten’s recipe – a perfect fit. With regard to the fat, she uses butter and I use a 50/50 mix of butter and lard (for savory pot pies, I omit the sugar). I have made two peach pies this summer! Peach is my favorite. And I have a bushel of tomatoes to can this week! I know this sound like sacrilege but I use Crisco for my fruit pie crust. Flakey every time. I use butter for savory pies and quiches but for a fruit pie I don’t like the taste. Maybe try lard if you can’t make yourself use Crisco. I have 10 in. pie plates because if you’re going to roll crust why not go big. 2 2/3 C flour. 1/2 tsp. salt. 1 C Crisco or lard. 7-8 Tbsp ice water added 1 Tbsp at a time. Makes 2 10 in pie crusts. If it’s warm in my kitchen I’ll throw the crust in the fridge for 5-10 min. I also cut in the fat with a pastry cutter. It gives you a much better feel and with practice you’ll know when it’s ready to add the water. I don’t understand egg yolk. Wouldn’t it make it tough? My other secret is a cloth rolling pin cover and pastry cloth. Welp, gotta add my 2 cents on pie making. I’ve been baking pies since I was a wee’un. The basic formula is 4 parts flour, 2 parts fat, 1 part water. I use 2 c flour, 1 c butter and ~1/2 c water. The trick is to remember to keep things COLD. 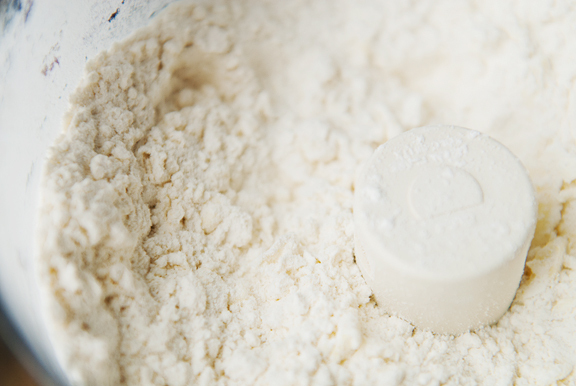 Remember how annoying cutting fat into flour is? (Which is why i see you cheat with a food processor?) I grate frozen butter. And mix it into the flour with a fork as the piles of grated butter pile up. Actually I mix the WHOLE thing with a fork. Then I add cold cold cold water little by little. Need the extra oomph of sure-fire way to get pie crust? Swap out some of that water for vodka from the freezer. It’ll give you the FEEL of liquid for rolling out purposes, but bake out far easier than water will. I also roll out my pie crusts between plastic wrap. No added flour to gum up the works. Kaweah was one of those so-special old-soul pups. 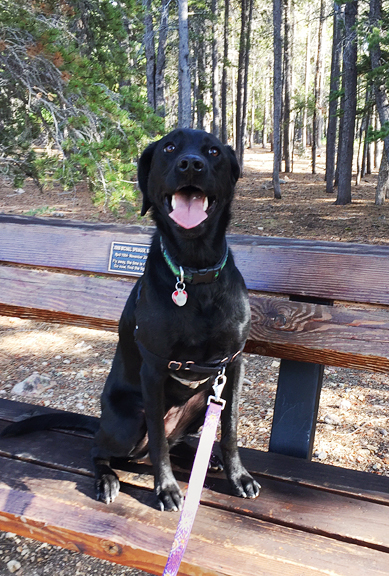 They come in all colors and sizes, but they’re often black labs. They look into your eyes and you can tell they GET it, even if they’re not so bright, necessarily. You all were so lucky to have her! Neva is a hoot. Jill - Actually, Neva was merely on high alert to all of the animals living in the high country. She is crazy. The weck jars are great because it's just glass and a rubber seal. No need to worry about BPAs. Also, they are gorgeous and come in several shapes and volumes. Annie - ugggh! I have that book! I always looked at the non-pie recipes. WHY?! I'll have to go and consult with it again. Thanks for the reminder and the tips! Susannah - ooh, thank you! I follow her on IG, but didn't think to check her blog. Jane M - nice, I'm glad to see someone uses lard. I'm tempted to, but it's just easier to grab butter since I always have plenty in my fridge or freezer. And thanks, I didn't realize that my pie dish might be a deep dish (which, it is). I'll keep that in mind! Jill - Thanks for the tip, and I am guessing the yolk adds some richness to the flavor? Tegan - awesome, yes - I've seen people grating frozen butter before. That sounds like a good way to do it as well as the vodka trick. And I also roll my crusts out between plastic wrap to avoid the stickage to just about everything :) Thanks for the bottom crust advice! “Kaweah was not a bright girl, but Neva is an even dimmer bulb.” This made me laugh out loud. I have a cat who’s not the sharpest tool in the shed, but that’s okay too. The dumb ones are even more adorable. Late entry here :) – I use lard because it makes the dough more flaky – using just butter tended to make it hard/crisp for me. 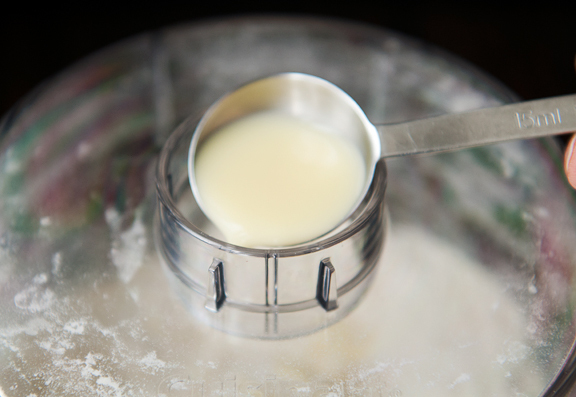 And I use a pastry cutter (instead of my Cuisinart or stand mixer) so I don’t over-mix the fats – should have clarified. Hi Jen, this pastry was so hard to work with. kept braking before it landed on the dish. I have a book that gives you the option to put cream on the pastry instead of water, it is very easy to roll and make in to a shape but it is very buttery too when is on a plate… yumm. For some reason my fruit never breakes down into a meesy goo. I had try this method of pies with apples ans now with the peaches. The fruit is cooked and soft but in its original shape. What is wrong with my pies?? Alison – thanks! I shall! Georgina – Nice tip on the cream, thanks! And yeah, I found the pastry very hard to work with. I *do* roll it between two sheets of plastic wrap, then remove one sheet and lay the pie crust down in the pie dish and peel the top sheet off. My pies fruit always keep their shape. I think if you want it to be gooey and less shapely, you might have to chop them up more or even pre-cook the filling?